The Daylight War is out and doing well having hit number three on the Sunday Times Bestsellers list at the weekend. For those who haven’t read it can you tell us a little bit about book three’s focus. The Demon Cycle is essentially a series of character studies during a pivotal time for the human race, when it will be decided if humanity will rise again in strength or be driven into extinction by demons that rise each night to ravage the land. There will be five books in the cycle. The first book, The Painted Man, focuses primarily on the character of Arlen Bales, a young man scarred by a demon attack in his childhood who learns how to fight back against the powerful creatures. Arlen may be destined to Deliver humanity from the demons, or to lead it to its destruction. More than this, the book is about fear, and how it can be both crippling and a real driver for change. The second book, The Desert Spear, focuses on Ahmann Jardir, who seemed an antagonist in the first book. Having claimed the title of Deliverer of the tribes of the Krasian Desert, Jardir invades Arlen’s homeland to conquer its people and levy them into all-out war against demonkind. Going back in time to Jardir’s childhood, the book tells the story of his rise to power by dint of his own courage and strength, but also the machinations of his wife, Inevera, a mysterious woman part seer and part Lady Macbeth. The book as a whole is an exploration of the other, and how when put in perspective, Jardir believes himself to be—and perhaps is—every much a hero and savior as Arlen. 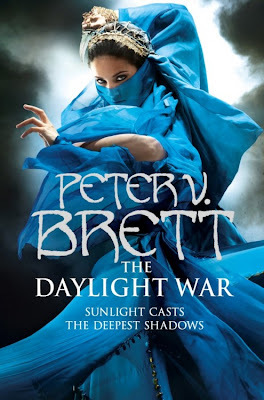 The third book, The Daylight War, introduces the point of view of Inevera, showing how the foretellings of the alagai hora, dice carved from demon bones with the power of prophecy, have shaped her own life, even as she uses them to shape her husband’s future and that of her dying people. The book focuses on relationships and how people rely on one another for strength in difficult times. It is also about how military invasion forces change on both the invaded and invaded alike, often in unexpected ways. Follow this link to read the full interview.